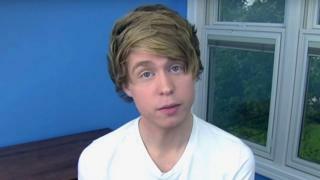 YouTube has decided to delete singer Austin Jones’s channel, after he admitted exchanging sexually explicit images and videos with underage girls. The video-sharing site was criticised after it left the singer’s videos online, despite him pleading guilty to charges in court. Other social networks were quick to remove his content but YouTube had decided not to act. It has now deleted the 26-year-old musician’s channel. Jones was arrested in 2017 and charged with possession of indecent images of children. He had gained more than half a million subscribers on YouTube uploading cover versions of hit songs. But he was accused of exchanging sexually explicit images and videos with underage girls between 2010 and 2017. Court documents said he had conversations with six different 14 and 15-year-old girls. In one conversation, he is said to have told one of the teenagers that she needed to prove that she was “his biggest fan” by sending him videos of herself. He also asked young fans to record videos of themselves dancing sexually. Videos of Jones demonstrating how to “twerk” were exposed online. He pleaded guilty to the charges on 1 February and will be sentenced in May. Prosecutors asked for him to be taken immediately into custody, but the judge allowed him to remain free on bail so he can go for psychiatric counselling. YouTube said it took claims of sexual misconduct seriously. It also said it did remove content when a person was convicted of a crime “in some cases”, particularly if the videos were related to the crime committed. The video-sharing site stopped Jones earning advertising revenue from his videos in 2017, when he was arrested.